Come. Join us in an ancient place of refuge and renewal. Help us get the word out about the upcoming Chartres Pilgrimages. Interested in coming on pilgrimage with Veriditas? We’d be delighted to have you join us. "The object of pilgrimage is not rest and recreation – to get away from it all. To set out on a pilgrimage is to throw down a challenge to everyday life." Click here to see a photo-essay by one of our recent participants. Walking a Sacred Path with Veriditas is a special pilgrimage to Chartres, France. It is a transformational program that is usually offered in two cycles. Each cycle includes one private, after hours labyrinth walk and one public walk. Most programs include morning seminars, small group discussions, an opening reception, a closing dinner, a tour of the crypt, a tour of the cathedral and leisure hours spent in the enchanting Medieval village that surrounds the magnificent Cathedral of Our Lady of Chartres. Most Walking a Sacred Path programs begin with registration on Monday at 4:00 PM and conclude with a celebratory dinner on Friday that ends by 10:00 PM. See schedule for each program for actual details. Facilitator Training begins 10 AM Saturday and ends 6 PM Sunday. See a sample schedule for Walking a Sacred Path Pilgrimages. "The art of movement, the poetry of motion, the music of personal experience, of the sacred in those places it has been known to shine forth. If we are not astounded by these possibilities, we can never plumb the depths of our own souls or the soul of the world. The force behind myths fairytales, parables and soulful travel stories reveals the myriad ways the sacred breaks through the resistance and shines forth into our world. Pilgrimage holds out the promise of personal contact with that sacred force. What is sacred is what is worthy of our reverence, what evokes awe and wonder in the human heart, and what, when contemplated, transforms us utterly." Spouse packages available if your spouse wants to come but not participate in the full program. Includes reception, dinner and tours. Simply select spouse package when you register. 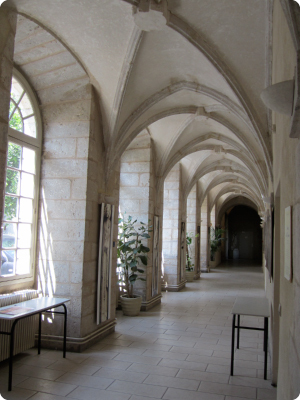 Living a short distance from the cathedral in the medieval and renovated "Seminary" literally in the shadow of one of the remaining active spiritual sites in the world. The world renown expert, Malcolm Miller - author of Chartres Cathedral - ot another experienced guide giving us a private group tour of the Cathedral and teaching us about the cathedral and the most complete collection of 12th and 13th century stain glass windows in the world. 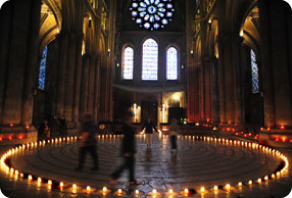 a private ritual evening after hours in the cathedral progressing through the crypt marked by thousands of candles. Discounts for group leaders bringing groups of 6 or more. Amount varies based on size of group. Email Dawn@veriditas.org for more information. What to bring, how to prepare, both physically and psycho-spiritually. Veriditas recommends purchasing travel insurance. Click here for a link to Travel Guard, specializing in insurance for our Chartres programs. Most airline flights will arrive at Charles de Gaulle Airport, Paris, France. You have a variety of options on getting to Chartres from CDG Airport. You can take an Air France bus (approximately 20 Euros) to the Montparnasse Train Station and take a train (approximately 12 Euros) to Chartres. Chartres is about an hour outside of Paris by train. You can make a reservation online for a car or small van to meet you at the airport and drive you to Chartres. The cost is 138 Euro per person. http://www.best-airport-transfers.com/ Once on the website, under Destinations, find France first and then Paris and fill in destination as Chartres. Other participants have used this service and it comes highly recommended. You can also consider the option of taking a taxi, though the cost will be in the range of 150 – 200 Euro or more. If several participants arrive at the same time, sharing a taxi will bring the price down. 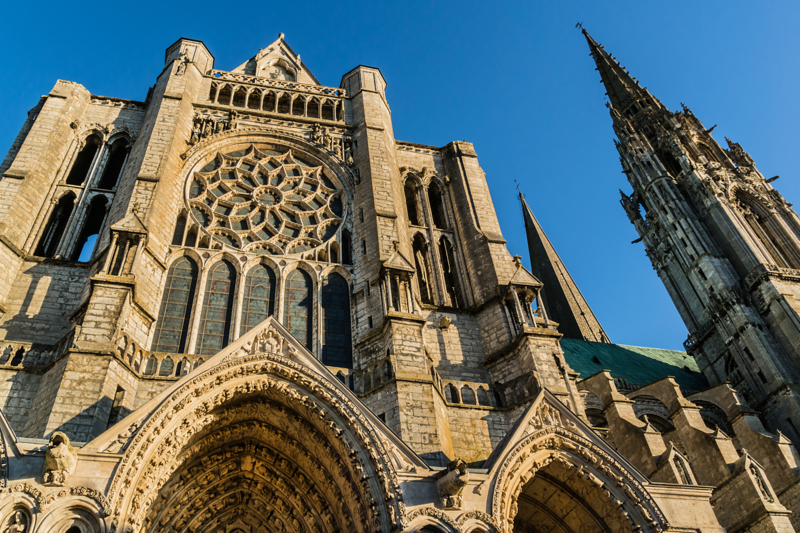 Chartres is a charming, medieval village with many options for eating out from casual fare such as omelettes and soup to fancier formal restaurants. 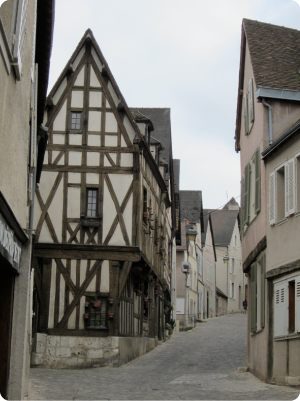 There are many places to stay in and around Chartres. If you are part of a Veriditas program, and wish to stay in the Maison St. Yves where the programs are held, and it appears that the online housing registration is full, please call the office at 707 283-0373 to discuss housing options and/or to be added to a waiting list for the Maison St. Yves where all programs are being held, or email anne@veriditas.org. For a list of other Chartres hotels, click here. Link here for the Chartres Tourism office web site where you can find information about restaurants, shopping, local activities and events, etc.